Home › Baer's pochard › Tufted duck - Aythya fuligula. The tufted duck (Aythya fuligula) is a diving duck belonging to the family Anatidae. The tufted duck species is distributed in Indian Subcontinent, Asia, Europe and occasionally United States and Canada. Aythya fuligula was previously included in the genus Anas. These species are considered closely related to A. novaeseelandiae and A. collaris. The tufted duck is a diving bird and the male duck is slightly larger than the female. The male bird measures 40 to 50 cm in length and weighs 600 to 1,000 grams. The female duck weighs 550 to 900 grams. The wingspan is 65 to 70 cm. The male is all black except for its white flanks. The bill is greyish blue. The eyes are pale yellow. The female duck is brown with pale brown flanks. The tufted duck species inhabit water bodies with abundant marginal and emergent vegetation. They occur in freshwater lakes, ponds, slow moving rivers, reservoirs, sheltered coastal habitats, lagoons, tidal creeks and estuaries. The tufted duck species are omnivorous and feed mainly by diving. They feed on aquatic plants, insects, crustaceans, molluscs and other aquatic vertebrates. The tufted duck breed from May onwards. The nest is constructed with plant matter on floating vegetation. Ground nests are also seen concealed in bushes, close to water edge. 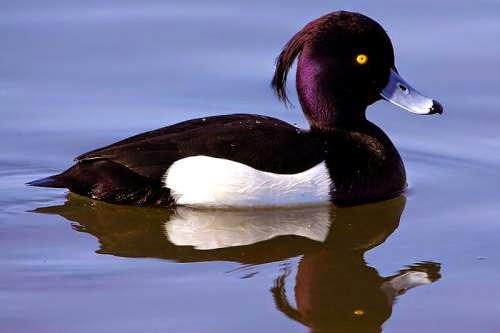 The breeding populations of tufted duck occur in Europe and north Asia (Russia, China and Mongolia). Wintering populations occur in central and south Europe, Africa, Indian Subcontinent, Middle East nations and Southeast Asia. The population in the central and northwest Europe is sedentary and the other populations are migratory. The migratory populations reach the breeding grounds from April onwards. The autumn wintering movements start from September. The IUCN (International Union for Conservation of Nature) has categorized and evaluated these tufted duck species and has listed them as of "Least Concern". Current topic in Birds of India: Tufted duck - Aythya fuligula.